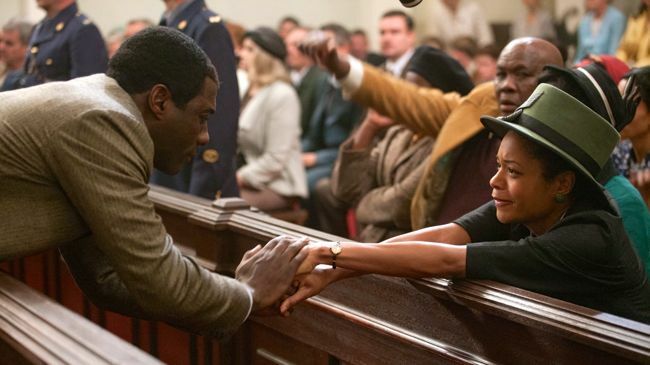 TORONTO – “Mandela: Long Walk to Freedom” is altogether earnest and honourable with fine performances by Idris Elba and Naomie Harris but its natural home appears to be television rather than the movies. Director Justin Chadwick is a noted TV director (“Bleak House”, “Spooks”) although screenwriter William Nicholson knows his way around epic material (“Gladiator”, 2000) and love stories (the superb “Shadowlands”, 1993). They do a good job to condense a mass of events in a very big life into an engaging narrative but their approach is too even-handed to make a lasting impression. Based broadly on the South African leader’s autobiography, it sketches his rural childhood quickly and moves on to his early days as a lawyer. The institutionalised casual racism is marked along the way as Mandela turns from political protest to radical action that leads to charges of sabotage and treason. His early marriage gives way to the dynamic involvement with his second wife Winnie Mandela and the trial in which he and his fellow activists avoid the death sentence but are condemned to almost three decades in prison. The facts of Mandela’s life have been known for a very long time and the film almost inevitably lacks the degree of contextual information that would match the man’s phenomenal impact on his country and around the world. The scenes of barbarism lack real power and often the landscapes, even those full of poverty, are bathed in warm tones. At 146 minutes, the picture settles into episodic narrative. Elba applies his considerable presence and charisma to the role and adds increasingly subtle nuances as the character ages. In the key scenes of history depicted, he steps up to embody a hero of almost unfathomable courage and conviction. Harris conveys Winnie’s fiery magnetism and determination and the chemistry between the two actors is striking. As a record of an extraordinary man’s life, “Mandela: Long Walk to Freedom” will do for now but perhaps one day we’ll see a drama that truly captures his struggles, strife and victories. Costume designers: Diana Cilliers, Ruy Filipe; Producers: Anant Singh, David M. Thompson; Executive producers: Cameron McCracken, Francois Ivernel, Geoffrey Qhena, Basil Ford, Sudhir Pragjee, Sanjeev Singh, Philisiwe Mthethwa, Hlengiwe Makhathini; Production company: Videovision Entertainment; Rating: UK-12 / US-PG-13; Running time 146 minutes. This entry was posted in Film, Reviews, TIFF Toronto International Film Festival and tagged 'Mandela Long Walk to Freedom', 20th Century Fox, Idris Elba, Justin Chadwick, Naomie Harris, Toronto International Film Festival, William Nicholson. Bookmark the permalink.